In addition to the repair work we carry out for garage doors, our Oceanside-based team can look after any gate related malfunction you may be dealing with. 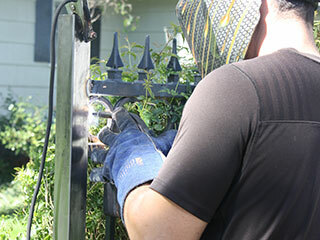 Our technicians can also install your new gate or help you to upgrade an old one. We understand how inconvenient it can be if your automatic gate suddenly stops functioning. That's why we offer a fast-response service for when you need someone quickly. We'll do everything we can to get your system back up and running again. Our knowledgeable contractors can answer any questions you have when it comes to residential gate installations. No job is too big or too small for us, which is precisely why we're considered an important support mechanism for homeowners in Oceanside. We work with a range of different brands and models, but the one constant factor is the fact that we only source replacement parts from trusted, high-quality names. These can range from clickers to remotes with recognition technology. Another task that we are frequently asked to perform is the re-programming of multicode remote controls. Our committed technicians will check all the electronics in order to ensure that the functionality of the opener is not impeded in any way. If you've noticed your gate looking a bit more crooked than it should be, it's likely that the hinges have become worn or damaged. During a service visit, our first task will be to confirm the reason for the misalignment. We'll check the welding, hinges, and also lubricate the moving parts of the door. You can count on us to restore your door back to proper position again. Taking everything into consideration, this is the time to give us a call. Regardless of the problem you're dealing with, we'll be able to troubleshoot it and get your automatic-gate working again. Contact us today at Garage Door Repair Oceanside, California.